This piece remakes the historic Military Trench Knife with a modern twist! The bandolier-style cast metal handle is formed into one of the most intimidating knuckle guards we've seen. With a row of seven bullet spikes plus a large "crusher" spike on the bottom, this handle offers total protection and a grip that won't let you down. Other features include a darkened stainless steel blade with partial serrations and a black nylon sheath with belt loop. Measures 11 1/2 in. overall. When I bought this for 10 bucks I thought it would be more of a fantasy display piece. It is not. It is very durable and sharp. The knife is deadly from all angles. It's not really my style, but I picked it up on a whim because it was it was $10. It is easily the scariest knife I own. Again, it's completely not my style and I almost feel odd owning it. That being said, if I ever had to fight for my life...this might be my weapon of choice. If you want one home defense blade for peace of mind but don't want to spend a lot due to the fact that you hope you'll never have to use it...this is it. Excuse the tone...this is a very positive review. It seems like it does what it's designed to do extremely well...but what it's designed to do is absolutely terrifying. 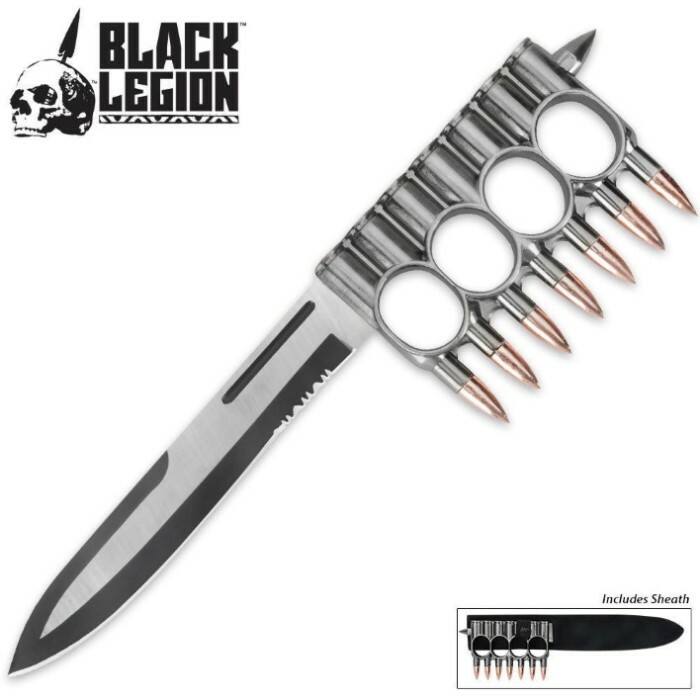 I got this knife as a substitute for a couple of paperweights that I ordered.I can't see how you could use it that isn't lethal.I nicknamed it "NEGAN"
This knife at $10.00 delivers! It is worth every penny and then some... Also get's people attention when you are wearing it. I have paid more for knifes and was less satisfied. $9.98 is well worth it for this trench knife. If one has big knuckles the finger holes are much larger then the WW1 1918 replica trench knife. A very sharp blade and heavy duty construction all the way around on this beast of a knife. At this low price I recommend buying two, one for each hand. This knife is even cooler than it looks in the picture. I showed the knife to my friends and they wanted one and they aren't even into knives.It came razor sharp and it has a great feel to it I can't believe it's only $10. I am very happy with this purchase, my first one from budk along with some other items. The knife feels great in your hand, and seems durable. It looks cool, and you can't beat a $10 knife with this quality! Well constructed and durable, plus has a great weight and comes sharp. A fantastic deal for an awesome piece. Why this went from $25, which is what I paid for my first two, down to $10 I will never know. It is a great quality knife. Very solid construction and have a most wild and awesome appearance. This is the best knuckle knife for the price by far! I have since purchased two more for me and four for relatives because of that $10 price. WHAT A BAHHGAN!! !